Forget all these modern day isotonic, hypotonic, hypertonic mass caffeine-boosting energy drinks that are being sold by the pannier load to energy-lacking cyclists. 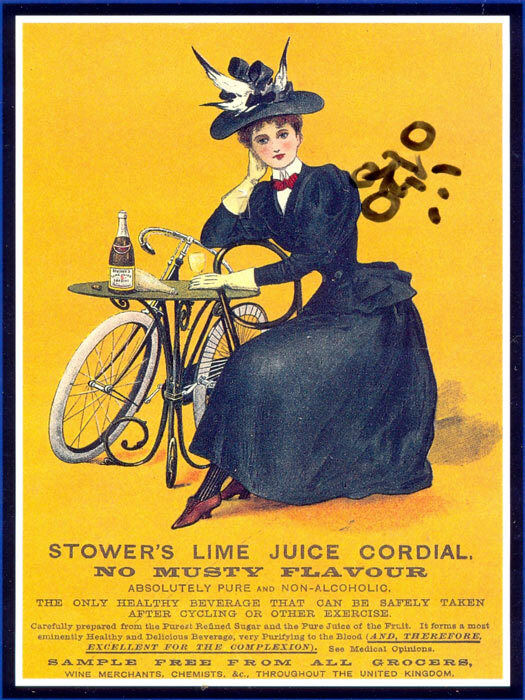 What we need more of is Stower?s Lime Juice Codial advertised in the posters of yesteryear as having ?NO MUSTY FLAVOUR?. Apparently it was ?The only healthy beverage that can be safely taken after cycling or other exercise?. The manufacturers, Alexander Riddle and Co. of London, carefully removed ?vegetable mucus and albumen? to ensure the purity of the cordial ? which is a bit of a disappointment as it sounds like they must have taken out all the flavour. But back to this century and back to October when I travelled down to Devon (it took three days!) with Molly to go to Ian Hibell?s memorial service in Brixham. The night before the service we camped in a farmer?s field in the first big storm of the winter ? floods, battering winds, falling trees. And cold. Had social services and the nanny state been alerted to our plight, I would have probably been arrested for allowing a two-year old to sleep out in such conditions. As it was, Molly survived the night intact (in fact, apart from a momentary sneezing frenzy, she slept through the whole storm which is more than can be said for me). The following morning I bundled her into the trailer (a Burley two-seater d?Lite with adjustable sunscreen technology, flow-thru mesh seat, recessed helmet well, tinted side windows and interior storage pockets ? for any potential Burley boffins among us) and cycled and half-staggered up and down Devon hill and dale in the second big storm of the winter ? driving rain, buffeting winds, wave-sprays from passing cars. Once again Molly displayed remarkable somnolent capabilities by sleeping through the whole splashing and wildly windy ride. By the time we arrived at the church she was a small round dry ball of warmth and I wasn?t. With sodden shorts and rivers of rain running in torrents off my jacket I thought I might be barred entry from the church. But the advantage of turning up at a cyclist?s memorial service is that cyclists are actually liked for once and the woman on the door insisted I bring the whole bike and trailer inside the church. After handing Molly a ?Where?s Spot?? book she sat us in a pew next to the radiator where I draped several layers of gloves, fleece and jackets out to dry. The surprising thing about Ian?s memorial service (one of the most prolific long-distance cyclists ever) was the lack of cyclists. I thought you wouldn?t be able to move for bikes parked in and around the church. Instead there were just two. My Roberts and a Brompton belonging to Andrew Hague (yes that one who used to make bicycle equipment) who had flown in from his home in Switzerland. But it was a good service and Ian went out on Frank Sinatra singing ?I did it my way?.